Bangkok is a great citz for art lovers too. Sure, we don’t have much classical arts here, and you won’t run across a Picasso anytime soon here, but there are lots of creative, artsy people here who do stuff. 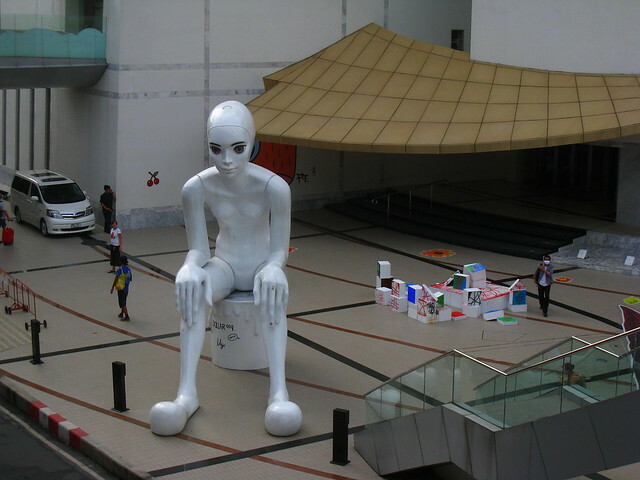 I call this guy “the alien who took too much skin whitening and diet products”. I’m sure there is a real story about him, but more importantly, the BACC (Bangkok Arts & Culture Centre) behind is an interesting building in the middle of popular Siam Square that many people just don’t take notice of. In it you find lots of art, small galleries and so on.